Pregnancy. Many, many, many women do it all over the world yet there is something strangely exciting and terrifying when it is the first time. Having a simple guide to what you are likely to experience during your pregnancy is a great way to ease the anxiety and enjoy the experience. The first trimester occurs during months 1 to 3, or, weeks 1 to 13. During this time your baby grows from the size of a poppy seed to the size of a lemon. Your baby’s life begins with conception and eventually becomes an embryo comprising of only 2 cells. During your first trimester your baby’s heart will begin to beat and their brain will form. By the end of the 13th week, your little one will develop into a fetus. You will likely feel extreme fatigue and experience frequent urination. You may have morning sickness and the hormones in your body will begin to fluctuate. The second trimester occurs during months 4 to 6, or, weeks 14 to 26. During this time your baby grows from the size of a nectarine to the size of a small head of lettuce. Your baby’s bones are hardening and their hearing is beginning to develop. By the end of the second trimester your baby is almost fully formed. You may notice the morning sickness decrease while backaches, indigestion, headaches, bloating and constipation increase. However, you should find you have more energy during this trimester. Take a prenatal exercise class or do prenatal exercises at home. Yoga is a great way to prepare your body for birth – just be careful not to overextend yourself or exercise too rigorously. Prepare the baby’s room – purchase furniture, paint (with non-toxic paint) and stock up on onesies, diapers and wipes. Organize and purge your home. That pile of clutter so easily taken care of now is going to be more difficult with a baby to take care of. Get rid of things you don’t need and organize the things that you have. Start making plans for your maternity leave – gather forms and applications. The third trimester occurs during months 7 to 9, or, weeks 27-40. During this time your baby grows from the size of a cauliflower to that of a pumpkin. Your baby’s brain will begin to process sights and sounds and their lungs are almost fully developed. By the end of the third trimester your baby is, obviously, fully developed. 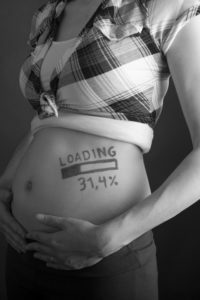 You are probably going to lose that second trimester energy and begin to feel tired again. You may experience Braxton Hicks contractions and pelvic pressure. Sleep may be difficult at this time. Because your uterus is crowding your diaphragm and organs, the baby weight is taking a toll on your body. Try to maintain a balance between light exercise and rest. Be sure to try and relax during this trimester – reducing stress will help for an easier labour and delivery. This is a great time to start packing your hospital bag and holding a baby shower with your friends and family. Otherwise, rest and wait for the big day when you’re beautiful infant joins this world!